Recognized as full-fledged only upon becoming able to fabricate own tools. Wajima Lacquer, one of Japan’s representative lacquerwares. The unique way of producing Wajima Lacquer is that products are made under division of labor system involving wide variety of professionals. 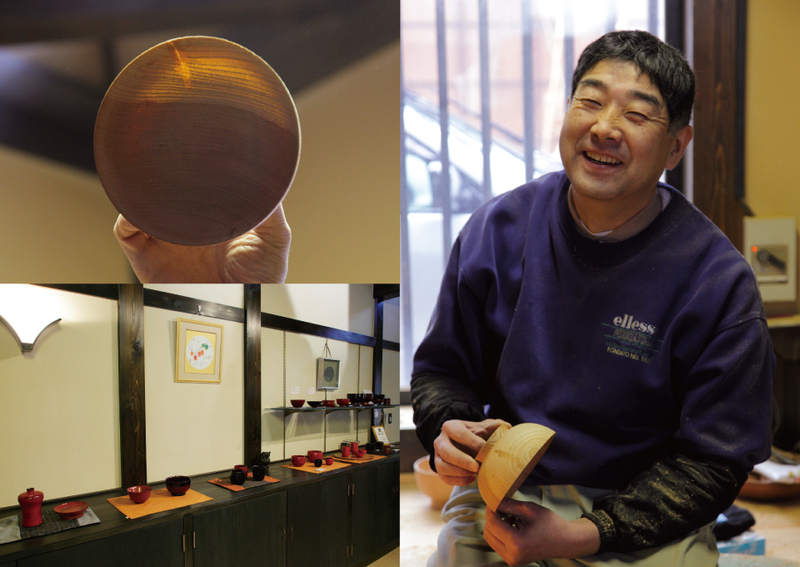 The person we met first was Yoshinobu Tsuji, a bowl wood substrate crafter. In his workshop located inside nagaya-style workshop (nagaya: a traditional Japanese tenement house) in Wajima, number of wood blocks and roughly-shaped wood substrates are put on from one end to the other. The central place, where a “rokuro” is placed to rotate wood substrate, is his home position. Many chisels, the tools to make wood substrate, are placed at the side. These chisels were made by him in fact. “Wood Substrate Crafter is considered full-fledged only upon becoming able to fabricate own tools. By having steel material heated, hammered, the blade edges are formed. Different blade angle makes different finish and influences efficiency of work. 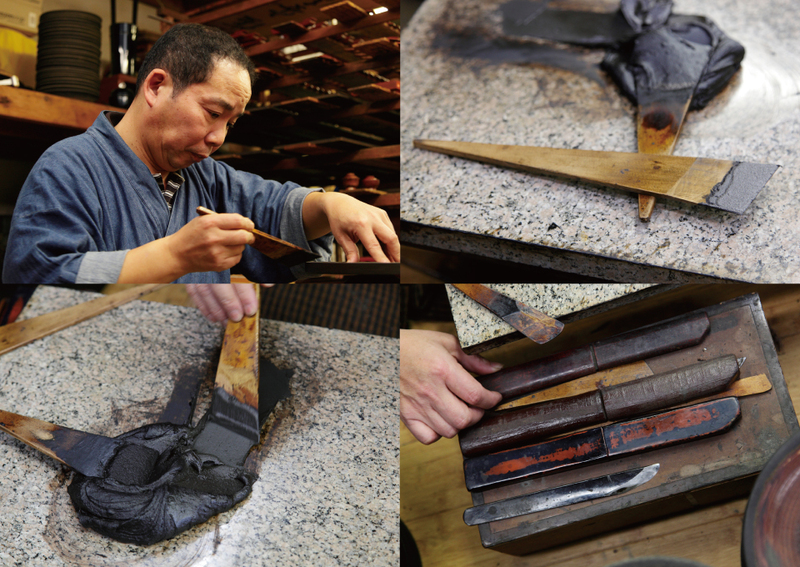 The angle of blade incorporates know-how each craftsman has developed”, explains Mr. Tsuji. 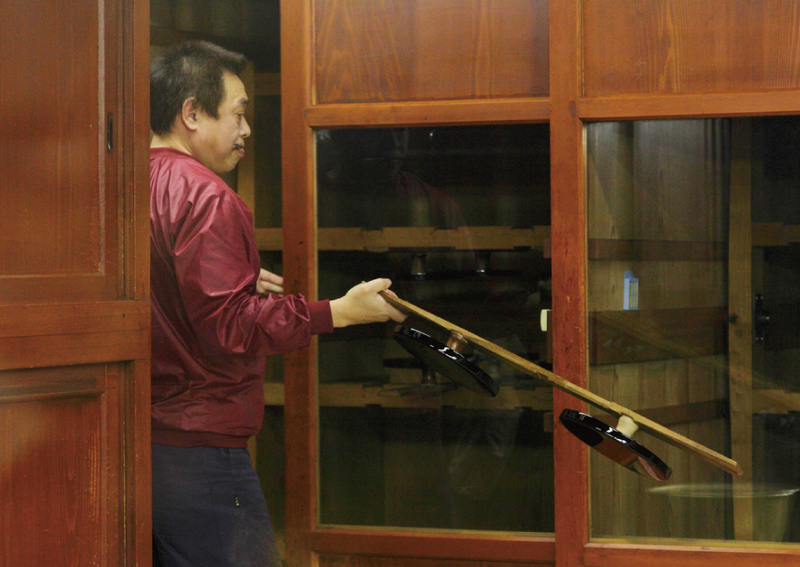 He is the 3rd generation Wood Substrate Crafter succeeded from his father and grandfather. He became apprentice to his father after graduating his local high school. His career as a craftsman has been 37 years. At the beginning he started to prepare materials and to clean up sawdust for his superiors by getting up at 6 o’clock in every morning. “The basic for craftsmen to develop the skills is to take ideas of how their superiors do. Taking an opportunity of cleaning up the workplace, we used to sneak a look at and learn how chisel blades of superiors are and listen to the sounds of gouging.” His son is also working as a Wood Substrate Crafter he says. “Once you produce something tangible, then it will remain as it is for generations and people will keep using it. We feel our responsibility and fun on this point. Once you obtain a set of techniques firmly, you become able to further challenge something new. I would like to encourage young people more to come up”. Upper Left：Wood block approximately got into shape. After going through drying in smoke for half a year, the after natural drying to control water content ratio for one year to stabilize dimensional preciseness, it is put into rough shaping process. Bottom Left：Planes that Wood Substrate Crafters made by own. Their own know-how are incorporated in some of those. Upper Right：Mr. 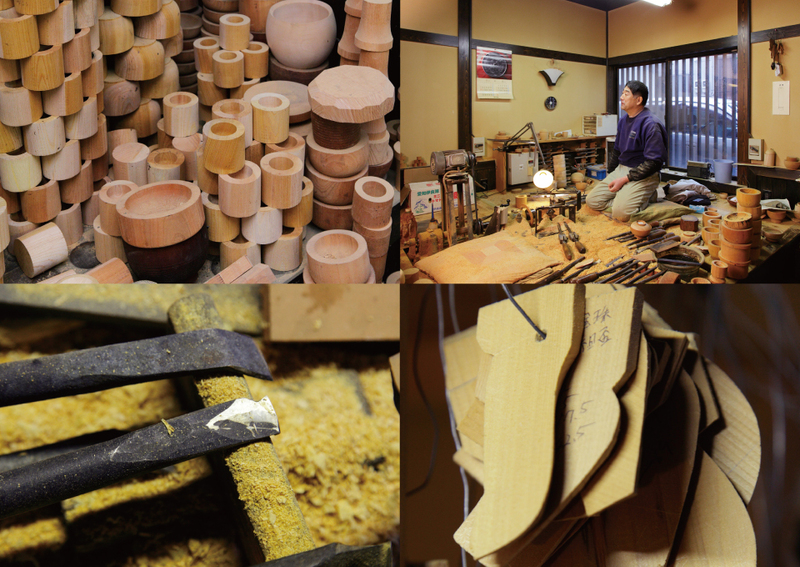 Tsuji’s workshop is located inside a nagaya-style workshop in Wajima. Bottom Right：Gauges to measure angles of bowls. They fit each other perfectly because of their long experiences. Left：Setting a wood block on a rokuro and shaping inside using a fine plane. Right：Shaping process goes on while checking not only by visibly but also from five senses monitoring gouging sounds and vibration on hands. This is the moment when all the experiences of craftsmen play critical role. Upper Left：The bowl wood substrate completed is as thin as you can see light coming through fibers of the wood that is visible. Bottom Left：Mr. Tsuji has set up a gallery next to his workshop. His original products that he shaped and his young brother lacquered are displayed and on sale. RIGHT：“I would like to work on creating something new while rediscovering good about traditional things”, Mr. Tsuji explained with a smile. Having wood substrate completed, they move onto the “coating” process. 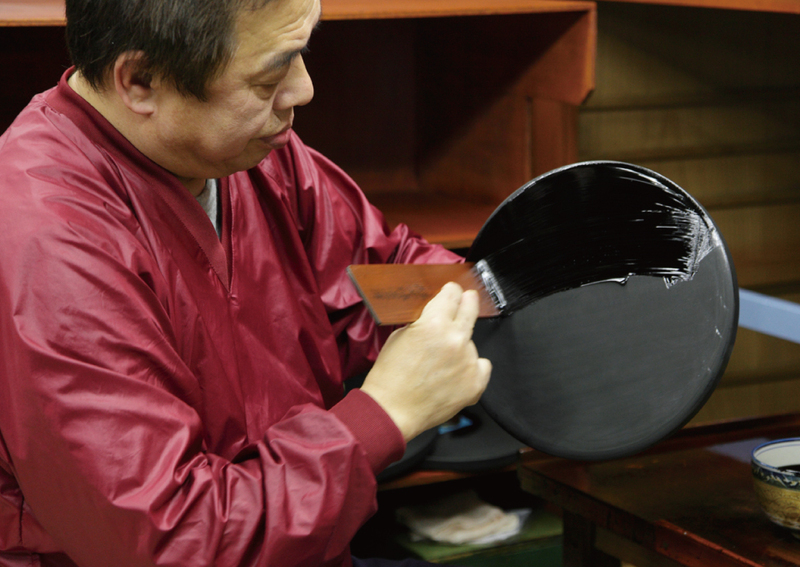 We had an interview with Shioyasu Lacquerware Workshop where we could take a tour from first to finish coatings. 10 craftsmen work there. Shigeaki Nakayama who works on first coating says, “The job of coating is to have it coated, dried, polished, and again coated, dried, polished, in a repetitive manner patiently. For Wajima Lacquer we perform Nunokise (Placing a piece of fabric for reinforcement purpose) then paste mixture of raw Urushi, rice glue, and Jinoko. While going through the first, second and third layers, fineness of Jinoko powder we use becomes different and we must subtly optimize the mixture at every work because of temperature and humidity variations that affect the curing time. Urushi is truly a living matter. It really requires your experiences”, says Mr. Nakayama. He also says that taking ideas of how their superiors do on their coating job is a key for everyone to develop its skills, and he used to keep his eyes on the angles of his superior’s paddle and how it was sharpened. Despite his experiences as long as 40 years, Mr. Nakayama still says “I have never been satisfied with my coating work. I always do with a motto ‘The next one must be the best’”. At this interview we thought we met a craftsman’s spirit of lifetime ambitions. After first coating is done, it goes to middle coating. Performing middle coat done entirely, dried, and polished to make the surface smooth. Repeat middle coating again. The next process is Fukiage (wiping). To make the surface further smooth, lapping is performed with blue grind stone or charcoal, wipe with cotton cloth to remove off hand marks and dusts. Having all of these completed, the process goes onto finish coating that is the final stage of the whole coating process. Mr. Nakayama performs first coat on a circular tray. The attractiveness of Wajima Lacquer is “Robustness”, realized by Nunokise and placing Urushi with Jinoko mixed for layers, he explains. Upper Left： The craftsmen’s eyes, devoting to their works. Bottom Left：Mixture of raw Urushi, rice glue, and Jinoko. The blending is optimized to adapt for each step of first coating. Upper Right：Paddles for first coating, made with Asunaro tree. Bottom Right：A knife used to shape paddles. By scraping with the knife they optimize angle and thickness of edges of paddles according to types of products. Fabricating these paddles is one of critical works of craftsmen that heavily affects their techniques. Upper Left： Making the surface smooth by lapping, after having first and middle coatings completed. The process right before being passed onto finish coating is called Fukiage that requires fine polishing. This work seems to have been done by women traditionally in the world of Wajima Lacquer. Bottom Left： Materials used for this lapping are blue grind stone and Suruga charcoal. Yes, final stage of this process is done with quality charcoal. Upper Right：After first coat is done, they move onto middle coating. They carefully perform the coating while being careful not to get dust. Bottom Right：Urushi used for middle coat. No dust allowed even a bit. Finish coating is one-shot deal. Finish coating is the final stage of whole coating process. Some Wajima Lacquerwares are finished with Roiro, Makie, or Chinkin decorative works, and some are completed only with this finish coating called “Nuritate finish”. The second one is really one-shot deal. No dust and brush trails are allowed. Thus the finish coating workshop is strictly managed under dust free environment. The temperature and humidity, that affect Urushi condition, are also under control. So, as you may notice, the photos here in this page was taken through the window of the room, not from inside. The craftsman working on finish coating is Akira Kosaka. His career is of bumps and detours. He originally entered Shioyasu Lacquerware Workshop and became apprentice on first coating for 4 years, got out to a fully different job by circumstance, and he once again became interested in working on Wajima Lacquer then started learning finish coating at another workshop, and finally came back to Shioyasu Lacquerware Workshop as a craftsman. 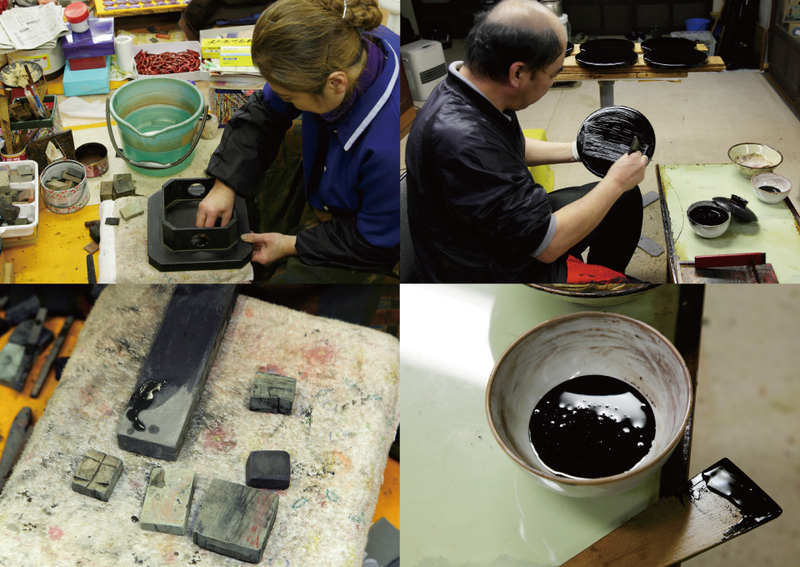 Mr. Kosaka carefully performs finish coating, placing quality finish coating Urushi by brush for several times. 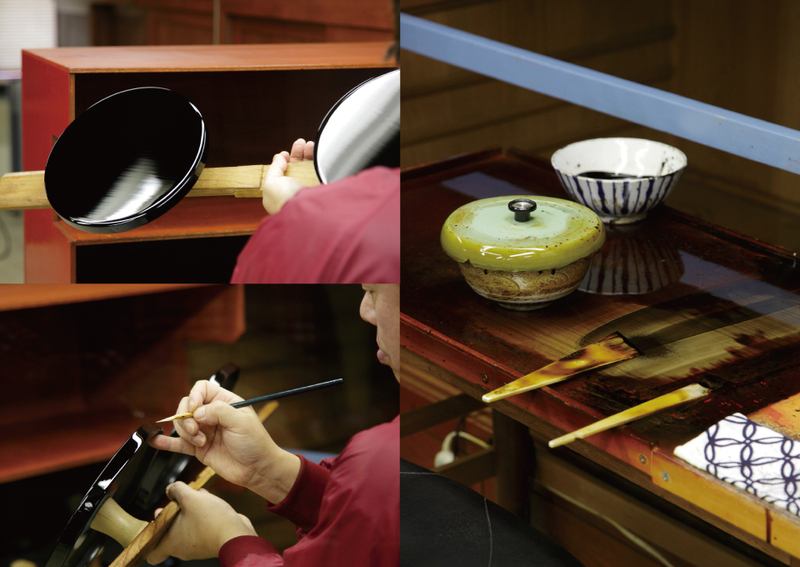 Removing dust by using the dedicated brush, placing a proper amount of Urushi roughly, and perform finish coat using a finishing brush. Upper Left：No dust is allowed to come. They carefully check. Bottom Left：In case dust comes on, they remove it by a rachis of a bird or a pointy bamboo stick. Right：Brushes used for finish coating are also made by craftsmen themselves. The materials are in fact women’s hairs cut in length, having tapped, unbraid, and washed with Urushi. After the finish coating is done, make it dried with care not to get dust in a space called “Nushi-buro” at 20 degrees C of temperature and 80% of humidity controlled. 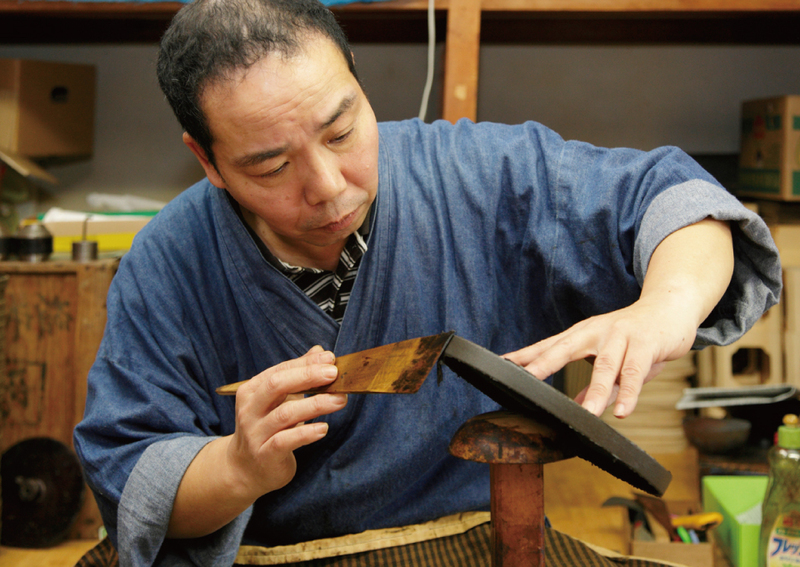 The products are kept turned at a certain frequency not to let the Urushi trickle down and to make the thickness even.